This video will illustrate a rapid, efficient method to methacrylate poly(ethylene glycol), enabling chain polymerizations and hydrogel synthesis. It will demonstrate how to similarly introduce methacrylamide functionalities into peptides, detail common analytical methods to assess functionalization efficiency, provide suggestions for troubleshooting and advanced modifications, and demonstrate typical hydrogel characterization techniques. Van Hove, A. H., Wilson, B. D., Benoit, D. S. Microwave-assisted Functionalization of Poly(ethylene glycol) and On-resin Peptides for Use in Chain Polymerizations and Hydrogel Formation. J. Vis. Exp. (80), e50890, doi:10.3791/50890 (2013). One of the main benefits to using poly(ethylene glycol) (PEG) macromers in hydrogel formation is synthetic versatility. The ability to draw from a large variety of PEG molecular weights and configurations (arm number, arm length, and branching pattern) affords researchers tight control over resulting hydrogel structures and properties, including Young’s modulus and mesh size. This video will illustrate a rapid, efficient, solvent-free, microwave-assisted method to methacrylate PEG precursors into poly(ethylene glycol) dimethacrylate (PEGDM). This synthetic method provides much-needed starting materials for applications in drug delivery and regenerative medicine. The demonstrated method is superior to traditional methacrylation methods as it is significantly faster and simpler, as well as more economical and environmentally friendly, using smaller amounts of reagents and solvents. We will also demonstrate an adaptation of this technique for on-resin methacrylamide functionalization of peptides. This on-resin method allows the N-terminus of peptides to be functionalized with methacrylamide groups prior to deprotection and cleavage from resin. This allows for selective addition of methacrylamide groups to the N-termini of the peptides while amino acids with reactive side groups (e.g. primary amine of lysine, primary alcohol of serine, secondary alcohols of threonine, and phenol of tyrosine) remain protected, preventing functionalization at multiple sites. This article will detail common analytical methods (proton Nuclear Magnetic Resonance spectroscopy (;H-NMR) and Matrix Assisted Laser Desorption Ionization Time of Flight mass spectrometry (MALDI-ToF)) to assess the efficiency of the functionalizations. Common pitfalls and suggested troubleshooting methods will be addressed, as will modifications of the technique which can be used to further tune macromer functionality and resulting hydrogel physical and chemical properties. Use of synthesized products for the formation of hydrogels for drug delivery and cell-material interaction studies will be demonstrated, with particular attention paid to modifying hydrogel composition to affect mesh size, controlling hydrogel stiffness and drug release. Poly(ethylene glycol) (PEG) hydrogels are common biomaterials used in regenerative medicine and drug delivery applications1-3. These hydrogels offer significant advantages over other biomaterials. PEG hydrogels are synthetic, offering a high degree of control over engineering properties such as modulus of elasticity and degradation rate compared to their natural biomaterial counterparts1. As they are synthetically derived, PEG has significantly less batch-to-batch variability versus naturally-derived materials4. Owing to the chemical composition of PEG, these hydrogels are highly hydrophilic, resistant to protein adsorption, and biocompatible3. This resistance to protein adsorption allows PEG hydrogels to act as a ‘blank slate’, enabling researchers to interrogate and study specific biological or chemical factors (drugs, biomolecules, cell adhesion peptides, etc.) and the specific roles these factors play in controlling cell and/or tissue behavior. Figure 1: Examples of poly(ethylene glycol) (PEG) architectures. A) Linear PEG. B) 4-arm PEG with a pentaerythritol core. C) 8-arm PEG with a hexaglycerol core. D) 8-arm PEG with a tripentaerythritol core. n is the number of PEG repeats on each arm. Each repeat has a molecular weight of 44 g/mol, therefore n can be calculated from the overall molecular weight and the structure/arm #. PEG precursors are available with a variety of architectures and molecular weights (Figure 1). Varying the architecture (arm #) and ethylene glycol repeats (n) of PEG can be used to control properties of hydrogel networks formed from these macromers. Unmodified PEG contains terminal hydroxyl groups which must be replaced with an alternate functionality to facilitate covalent crosslinking via polymerizations, the most commonly employed crosslinking strategy for PEG hydrogels, prior to formation of hydrogel networks. There are a variety of chemical groups which can be incorporated into PEG macromers to facilitate polymerization and network crosslinking (acrylate, methacrylate, vinyl ether, norbornene, etc.). Despite the variety of terminal functionalities available to facilitate crosslinking, there are only two mechanisms by which polymerization can occur: step- and chain-growth (or a mixture of the two, mixed-mode). Figure 2: Theoretical hydrogel network schematic. A) Traditional chain-growth polymerization results in heterogeneous networks containing dense poly(methacrylate) crosslinking regions and increased network nonidealities such as loops, unreacted precursors, and permanent entanglements. B) Step-growth polymerization results in significantly more homogeneous network structures (not to scale). Functionalities which crosslink via chain-growth polymerization do not require the presence of an additional crosslinker. 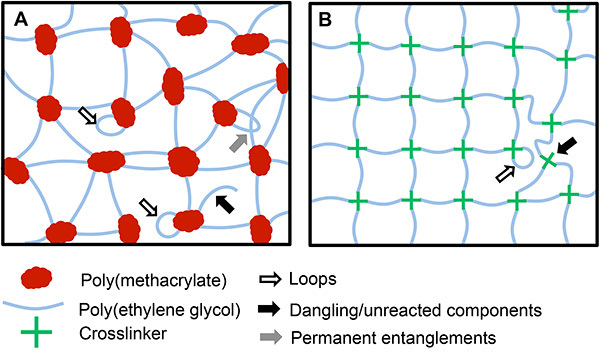 However, chain-polymerized hydrogels produce heterogeneous network structures containing dense crosslinking regions (Figure 2A)1. In contrast, step-growth polymerization requires the use of a crosslinker or co-monomer which is reactive with the terminal functional groups of the PEG macromers. As the terminal functional groups on the PEG can only react with the crosslinker and the crosslinker can only react with the terminal functional groups on the PEG, this results in greater network structure homogeneity (Figure 2B)1. Step-growth polymerizations also typically lead to higher conversion of functional groups, decreasing the amount of unreacted precursors and potential for immune/inflammatory responses due to soluble, unincorporated macromers1. Mixed-mode polymerization methods have also been developed that combine both step- and chain-growth polymerization through use of macromers that can both self-react (chain-growth) and react with a crosslinker (step-growth). This produces hydrogels with characteristics of each polymerization mechanism, and can be used to produce more complex, diverse network structures than either step- or chain-growth networks alone1. While there are a plethora of functional groups which can be used to functionalize PEG and facilitate hydrogel formation, methacrylates and norbornenes are some of the most common chain- and step-growth polymerization moieties, respectively. Both of these functionalities offer excellent spatiotemporal control over network polymerization, and when used to encapsulate cells, these networks support high overall cell survivability5-7. Dimethacrylate functionalized PEG (PEGDM) crosslink via chain polymerization and allows for the incorporation of biomolecules or other factors through co-polymerization with acrylate-, methacrylate-, or similarly-functionalized biomolecules5,6. PEGDM hydrogels have significant advantages over alternate chain-growth polymerization systems such as acrylate functionalized PEG (PEGDA). Using traditional methods, PEGDA can be synthesized more rapidly than PEGDM; however, using microwave-assisted synthesis, PEGDM synthesis is even more efficient. PEGDA is often synthesized in overnight8 or 24-hr9 reactions, but can also be synthesized in four hours at elevated temperatures10. PEGDM is also traditionally synthesized by reacting overnight11 or for 24 hr5, with some methods extending the reaction time to 4 days12. Using the microwave-assisted method demonstrated here, PEGDM can be produced in a 5 min reaction. While PEGDM has slower reaction kinetics than PEGDA13, the crosslinking reaction for PEGDM is still rapid, occurring in minutes, and achieves greater macromer conversion than PEGDA as the increased hydrophobicity of the methacrylate group increases functional group aggregation in solution, thereby increasing the probability of radical transfer and methacrylate conversion14. 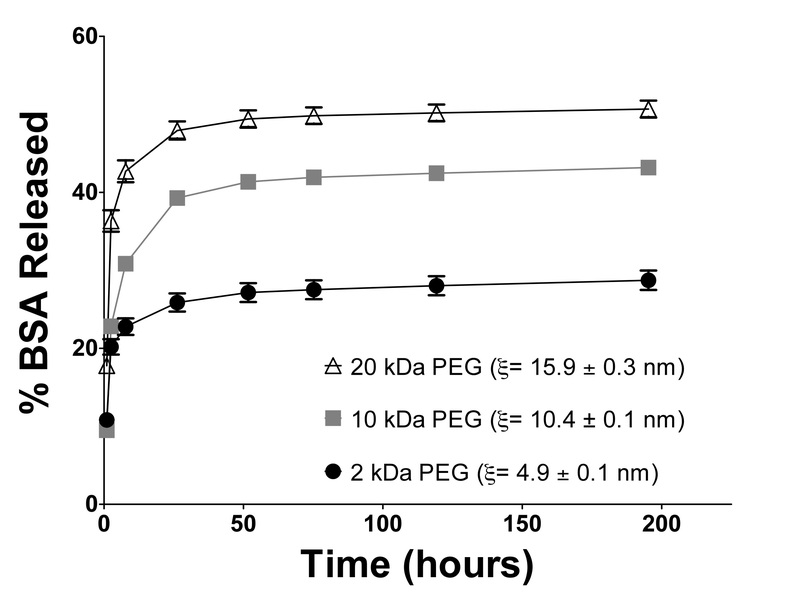 PEGDM hydrogels are also associated with increased cellular viability and growth as compared to PEGDA hydrogels, likely due to the decreases in reaction rate at any given time, which reduces radical concentration and unreacted macromers present14. Thiol-ene polymerizations such as those using norbornene-functionalized PEG (PEGN) form hydrogels via step-growth polymerization, and require the use of PEGN and a crosslinker that contain an average of greater than two functional groups. Since thiyl radicals react with norbornene carbon-carbon double bonds, multi-thiol containing crosslinkers are commonly used to crosslink PEGN hydrogels, allowing for facile incorporation of peptides with cysteine amino acids functionalities7. While there are numerous other chemistries which react via step-growth polymerization (Michael-addition reactions such as thiol-acrylate15 and thiol-vinyl sulfone16, “Click” reactions such as alkyne-azide17 etc. ), thiol-norbornene hydrogels are very common, as the strain from the norbornene ring significantly increases the reaction rate and decreases the chance of the norbornene double bond undergoing chain polymerization7. The decision between methacrylate, norbornene, or alternate functionalization to facilitate hydrogel formation is largely based on the approach. For example, chain-growth polymerized PEGDM networks have been demonstrated as well suited to control cell localization in the development of a tissue-engineered periosteum18,19. Step-growth polymerized PEG networks are better suited for the incorporation of peptide sequences to facilitate enzymatically-responsive hydrogel degradation, due to the ease of incorporation of enzyme substrate sequences using thiol (cysteine) containing peptides and norbornene functionalized macromers20. If the research question will be best addressed by the use of step-growth hydrogels, Fairbanks et al. provides a detailed description of the norbornene functionalization strategy for PEG7. This paper will detail how PEG and peptide sequences can be functionalized (with a methacrylate for PEG, and a methacrylamide for peptides) for chain polymerization reactions. Traditionally, PEGDM is produced by reacting PEG with methacryloyl chloride and triethylamine in dichloromethane. The reaction is allowed to progress at room temperature overnight11 or for 24 hr5, with some methods extending reaction time to 4 days12 before filtration, precipitation in diethyl ether, and collection. While many variations of this approach exist, all are time-consuming, require a large array of chemical synthesis equipment, and are not environmentally friendly, as they involve the use of relatively large amounts of high-purity reagents and solvent. To circumvent these limitations, Lin-Gibson et al. developed a microwave-assisted, solvent-free method to functionalize PEG with terminal methacrylate groups (Figure 3A)12. In this reaction, the terminal alcohol groups of the PEG react with one of the carbonyl atoms of the methacrylic anhydride to form a carboxyl. This generates the PEGDM product, with methacrylic acid as a side product. This synthesis has many of the characteristic advantages of microwave synthesis, including reduced reaction time and solvent-free synthesis methods21. The microwave synthesis is preferable to the previously discussed methods as it is significantly faster, requires less extensive synthesis equipment (e.g. glassware, reaction plates), and uses less overall reagent and solvent amounts as solvents are only required for product purification/collection and not for synthesis, making it more economical and environmentally friendly. Figure 3: Functionalization schematics. A) Poly(ethylene glycol) is reacted with 10x molar excess methacrylic anhydride to produce poly(ethylene glycol) methacrylate. B) This same method can be used to functionalize the N-terminus of peptide sequences, forming a methacrylamide functionalized peptide. By performing this procedure prior to cleaving the peptide from the resin, selective functionalization of the N-terminus can be performed as amino acid side groups remain protected. n: number of PEG repeats in the macromer (n=45.5, 227 and 455, respectively, for the 2, 10, and 20 kDa linear PEG used). R1 to RN: amino acid side chains. PG1 to PGN: side chain protecting groups. TFA: trifluoroacetic acid. TIPS: triisopropylsilane. DODT: 3,6-dioxa-1,8-octanedithiol. H2O: water. The microwave-assisted methacrylation method has been recently adapted by our group to functionalize the N-terminus of peptides with methacrylamide groups (Figure 3B) to facilitate peptide incorporation into a variety of polymers and polymeric networks. In this reaction, the primary amine of the N-terminus of the peptide reacts with the carbonyl atom on the methacrylic anhydride to form an amide. This generates the methacrylamide functionalized peptide, with methacrylic acid produced as a side product. When using this procedure to functionalize the N-terminus of peptide sequences, it is important that amino acids containing reactive side chains (primary amines (lysine), alcohols (serine, threonine), and phenols (tyrosine)) are protected during functionalization, and protecting groups are only cleaved after methacrylamide incorporation. This article will demonstrate both of these microwave-assisted methods to synthesize PEGDM and functionalize on-resin peptide sequences, highlighting common pitfalls and suggesting troubleshooting methods. In this article, methods to perform analytical chemical techniques commonly employed to assess product functionalization will be detailed, and suggestions and resources for performing more advanced modifications will be given. Typical results will be demonstrated, which include using the synthesized PEGDM to form hydrogel networks, exploiting the formed hydrogels to control release of a model drug, and employing functionalized peptides to facilitate cell-hydrogel interactions. Particular attention will be paid to characterizing hydrogel mesh size and discussing how hydrogel composition can be tuned to affect this underlying physical property, which in turn controls bulk material properties such as stiffness and drug release profile. To prevent contamination with water, pre-dry all glassware being used in an oven (>60 ºC) for 1 hour. Note: Required glassware includes: two 100-ml beakers, a 250-ml beaker, 3 spatulas, a 250-ml Büchner flask, a 7-cm Büchner funnel, a 10-cm watch glass. Pre-chill 100-150 ml anhydrous diethyl ether (74.12 g/mol) for precipitation subsequently performed at step 1.6 by pouring it into a beaker, covering the beaker with a watch glass, and placing the beaker into a recrystallization dish filled with ice. Move microwave and vortexer into a chemical fume hood. Note: Diethyl ether may also be prechilled by placing the beaker in a chemical freezer. The lower diethyl ether temperature achieved by chilling in a freezer will increase the rate and efficiency of precipitation. In a small weigh boat, weigh out 5 g of poly(ethylene glycol) (PEG) of the molecular weight of your choice (1,000-100,000 Da). If present, remove the plastic piece from the lid of the scintillation vial. Tare the vial, and dispense 10 molar excess of methacrylic anhydride into the vial (MA, 154.16 g/mol) per equation 1 in the hood. Add PEG to the scintillation vial. where is the mass of PEG in g, is the molecular weight of PEG in g/mol, is the number of terminal OH groups on the PEG, and is the molecular weight of MA in g/mol. Loosely twist the cap onto the scintillation vial. Set the microwave to 5 min on maximum power. Wearing heat-resistant gloves, remove the vial from the microwave every 30 sec. Fully tighten the cap and vortex for 30 sec. Repeat until the solution has been microwaved for the full 5 min. The cap may need to be replaced during the procedure due to cracking. With the cap loosened, let the PEGDM cool to room temperature. Dissolve the PEGDM in a small amount (10-15 ml) of dichloromethane (DCM, 84.93 g/mol). Note: It is recommended that the PEGDM be allowed to cool significantly (~5 min) prior to DCM addition, to prevent boiling of the DCM (a suspected carcinogen) due to residual heat. The PEGDM can be broken into small chunks using a spatula and vortexed to aid in dissolution. Precipitate the PEGDM in 10x excess ice-cold diethyl ether for 20 min. Note: It may be necessary to scratch the beaker side with a spatula to initiate crystal formation to precipitate lower molecular weight PEGs (2,500 Da); however, PEG with a molecular weight below 1,000 Da will not precipitate despite scratching. Using a Büchner funnel and flask, collect the PEGDM by vacuum filtration. Do not filter to complete dryness, as this will promote water adsorption to the PEGDM. Note: If necessary for the specific vacuum system in use, a vacuum trap can be placed between the filtration setup and the vacuum source to protect the vacuum pump from damage by solvent vapors. Transfer the filtered PEGDM to a 50 ml conical tube with a large gauge needle pierced through the cap for ventilation. Store overnight in a vacuum chamber to dry. Redissolve PEGDM in DCM and reprecipitate (as in steps 1.5-1.7) as a final step to remove unreacted MA. Dry again as in step 1.8. Using deuterated chloroform (120.38 g/mol) as the solvent, prepare samples for 1H-NMR. Place a small sample of the PEGDM (≈10 mg) in a scintillation vial with a small amount of the solvent (≈1.0 ml). The target concentration is 10 mg/ml. Once the sample is dissolved, transfer it to a clean NMR tube. The sample should fill the bottom 4-5 cm of the NMR tube. Collect the proton NMR spectra. Our data is collected using a 400 MHz spectrometer. Run samples at room temperature for at least 64 scans to obtain sufficient data resolution. If NMR analysis (Figure 4) indicates PEGDM functionalization is less than 90%, the methacrylation procedure should be repeated. Adjust the mass of MA used to account for the reduced amount of unfunctionalized PEG. where is the observed area under peak d (δ=6.63 ppm), is the observed area under the methacrylate proton peaks (a, δ=1.94 ppm; b and c, δ=5.57 and 6.12 ppm), and is the theoretical number of methacrylate protons (a=3* , b=1* and c=1* - 6, 2 and 2 respectively for linear PEG). The percent functionalization calculation should be performed using peaks a, b and c separately, and then averaged to obtain an overall percent functionalization. Note: Sufficiently functionalized PEGDM can then be dialyzed (in water, against water) and collected by lyophilization to remove residual methacrylic anhydride and methacrylic acid. The final product should be mixed with a small amount (0.01 wt%) of inhibitor such as citric acid or vitamin C and stored with desiccant at -20 °C until use. The final PEGDM product can be used to produce hydrogels, as detailed in the JoVE article by Khetan and Burdick22. Note: Our peptides are synthesized using Fmoc-Gly-Wang resin, using an automated peptide synthesizer with UV monitoring, and 0.2 M amino acid solutions in N-methylpyrrolidone (NMP, 99.1 g/mol). 5% piperazine (86.1 g/mol) in dimethylformamide (DMF, 73.1 g/mol) is used for deprotection, 0.5 M O-Benzotriazole-N,N,N’,N’-tetramethyl-uronium-hexafluoro-phosphate (HBTU, 379.3 g/mol) in DMF is used as the activator, and 2 M diisopropylethylamine (DIEA, 129.3 g/mol) in NMP is used as the activator base. Peptides can also be obtained from a commercial peptide supplier. When using commercial sources it is critical that peptides are procured on-resin with the amino acid side chain protecting groups intact rather than fully cleaved, as is standard. Note: It is important that any amino acids with reactive side chains are protected to ensure that methacrylamide functionalization only occurs at the primary amine of the N-terminus of the sequence. See Table 1 for amino acids with reactive side groups, and typical protecting groups. Amino acids with protecting groups are incorporated into the sequence during peptide synthesis in the same manner as nonprotected amino acids, and are often available from the same amino acid suppliers. Table 1: Reactive amino acids and typical protecting groups. Synthesize peptides using standard solid phase peptide synthesis, and store on resin at 4 °C in DMF until ready for use. Using a 7 cm Büchner funnel with filter paper and 250 ml flask, collect the peptide resin from the DMF via filtration. If present remove the plastic piece from the lid of the scintillation vial. Transfer the resin to the scintillation vial. Using a disposable pipette, add just enough MA to cover the resin in the scintillation vial. Loosely place the cap onto the scintillation vial. Set the microwave to 3 min on maximum power. Wearing heat resistant gloves, remove the vial from the microwave every 15-20 sec. Fully tighten the cap and vortex for 15 sec. Repeat until the solution has been microwaved for the full 3 min. With the cap loosened, let the peptide solution cool to room temperature. Using a small amount of DMF and a Büchner funnel with filter paper and flask, collect the peptide resin from the vial. Transfer the peptide resin to a fresh scintillation vial and cleave and deprotect the peptide. Per 0.25 mmol of resin, we use a 2 hr room-temperature reaction with rotation, using a cleavage cocktail of 18.5 ml trifluoroacetic acid (TFA, 114.02 g/mol) with 0.5 ml each of triisopropylsilane (TIPS, 158.36 g/mol), 3,6-Dioxa-1,8-octanedithiol (DODT, 182.30 g/mol) and deionized-water (18.02 g/mol). Note: This cocktail is sufficient for most peptides, but will not deprotect 2,2,4,6,7-pentamethyl-dihydrobenzofuran-5-sulfonyl (Pbf)-protected amino acids (commonly used to protect arginine side chains). If the sequence contains any Pbf-protected groups, 0.5 ml of the TFA should be replaced with 0.5 ml thioanisole (124.20 g/mol) and cleavage time increased to 4 hr. Note: If a cloudy, crystalline substance forms in the cleavage cocktail, the peptide is likely crashing out of solution and the volume of the cleavage cocktail should be doubled. Chill 400 ml anhydrous diethyl ether on ice in a beaker covered with watch glass. Precipitate the peptide in 10x excess diethyl ether, and divide the solution evenly amongst four 50 ml conical tubes. Centrifuge at 3,200 x g for 10 min to collect the peptide. Decant off the ether, and resuspend the peptide in 100 ml fresh diethyl ether divided between two 50 m conical tubes. Repeat the centrifugation process, resuspending in 50 ml of fresh ether twice for a total of 4 ether washes. Note: This removes the chemicals used in the cleavage cocktail and cleaved protecting groups from the solid peptide. After the last centrifugation step, decant the waste ether and dry the peptide overnight under vacuum. Use 50:50 H2O:Acetonitrile (41.05 g/mol) + 0.1% TFA as the solvent for MALDI-ToF analysis of peptide samples. Place a small sample (1 - 2 mg) of the peptide in a 1.5 ml Eppendorf tube and dissolve the sample in 1 ml of MALDI solvent. Prepare the matrix solution. A commonly employed matrix is α-Cyano-4-hydroxycinnamic acid (CHCA, 189.2 g/mol) as the matrix. Dissolve 10 mg/ml matrix in MALDI solvent, forming a stock matrix solution. Note: The matrix stock solution can be stored at room temperature for up to one week for additional analyses. Combine the peptide and matrix solution in a 1:1 ratio. Spot this combined solution onto three separate locations on the MALDI sample plate, adding 1 μl/spot. Dry the spots, either by air drying or using a heat gun. Respot and dry each sample. Note: Respotting produces a more uniform peptide/matrix sample, and assists in obtaining a clear signal. A standard peptide mix should also be combined with the matrix solution in a 1:1 ratio and spotted (only once) onto the MALDI plate. Collect the MALDI-ToF data. Due to the addition of the methacrylamide group to the N-terminus of the peptide, there should be a 68 g/mol increase in molecular weight above that of the peptide molecular weight alone. Note: Unlike the PEGDM synthesis, peptides cannot be refunctionalized, as upon cleavage the protecting groups on amino acids with reactive side chains are removed, and the selective functionalization of the N-termini can no longer be ensured. If the MALDI analysis (Figure 5) indicates the peptide was correctly functionalized and all protecting groups appropriately cleaved, the peptide can be dialyzed (in water, against water) and collected by lyophilization to remove residual contaminants (cleavage cocktail, ether, cleaved protecting groups etc.). The solid peptide should be transferred to a small Eppendorf tube and stored at -20 °C until use. Proton nuclear magnetic resonance is one of the most common analytical techniques to assess the efficiency of a chemical reaction, as the area under each spectra peak is proportionate to the relative levels of that proton in the sample, allowing determination of the ratios of product and reactant in the sample. For this reaction, 1H-NMR analysis (Figure 4) can be used to calculate the % functionalization from the observed: theoretical ratio of terminal methacrylate protons (a, b and c) to central PEG protons (d). The PEGDM shown in Figure 4 was 2,000 Da prior to functionalization; therefore n=2,000 Da/(44 Da/PEG repeat) = 45.5, so d=4*(n-1)=178, making the proton: NMR unit ratio 178/102.16=1.74. In this case, peak a cannot be used in assessing % functionalization, as the presence of water in the sample artificially increases the area under the peak. Using peak b, the % functionalization is 1.00*1.74/2*100%=87.1%; using peak c, the % functionalization is 1.08*1.74/2*100%=94.1%. Therefore, the overall % functionalization is 91% and this PEGDM is adequately functionalized for use in hydrogel synthesis. Typically, approximately 90% functionalization is achieved after a single round of methacrylation. Due to the multitude of proton peaks that arise in 1H-NMR analysis of peptides, peptide functionalization is more easily investigated using MALDI-ToF mass spectrometry. This is demonstrated in Figure 5, where the peptide GKRGDSG was synthesized and subjected to methacrylamide functionalization. A small fraction of the peptide was cleaved for prefunctionalization molecular weight assessment (Figure 5A), which showed the observed molecular weight peak occurring at 676 g/mol, the expected molecular weight of the peptide, indicating correct synthesis of the peptide sequence. The remainder of the peptide underwent methacrylamide functionalization prior to cleavage. As this peptide contains Pbf protected R amino acids, cleavage was performed in a cocktail containing thioanisole for 4 hr. After methacrylamide functionalization, the observed molecular weight peak occurs at 744 g/mol (Figure 5B), the expected weight of the methacrylamide functionalized peptide (676+68 g/mol) and not at the expected molecular weight of the unfunctionalized peptide, indicating correct functionalization. 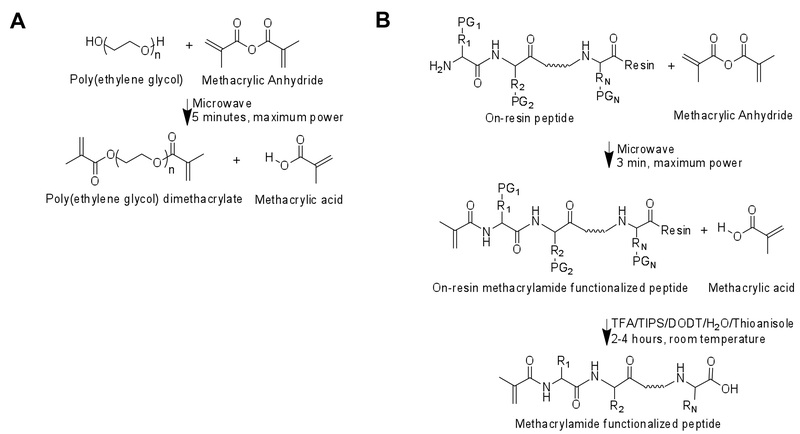 To demonstrate functionality of both the PEG and the methacrylamide functionalized peptide, PEGDM hydrogels were produced with and without 0.5 mM methacrylamide functionalized GKRGDSG (Figure 6). Hydrogels were produced with 10 wt% linear 10 kDa PEGDM in PBS, with 0.05 wt% Lithium phenyl-2,4,6-trimethylbenzoylphosphinate (LAP) as photoinitiator. The hydrogel precursor solution was injected between two glass slides separated by a glass slide spacer and held together with binder clips. Precursor solution was then exposed to 365 nm UV light at 2 mW/cm2 for 10 min to induce crosslinking, after which 8 mm diameter gels were collected using a cylindrical punch. Gels were rinsed in PBS and allowed to swell for 2 days to ensure equilibrium swelling conditions were achieved16,20 . Human MSCs (passage 3) were grown to 80% confluency and seeded on hydrogels at 15,000 cells/cm2. The cells were allowed to adhere for 48 hr before being transferred to fresh media containing 0.5 µl/ml calcein AM and 2 µl/ml ethidium homodimer (LIVE/DEAD Viability kit from Invitrogen) and imaged under phase contrast and fluorescence at 10X magnification using a Nikon Eclipse Ti 2000. 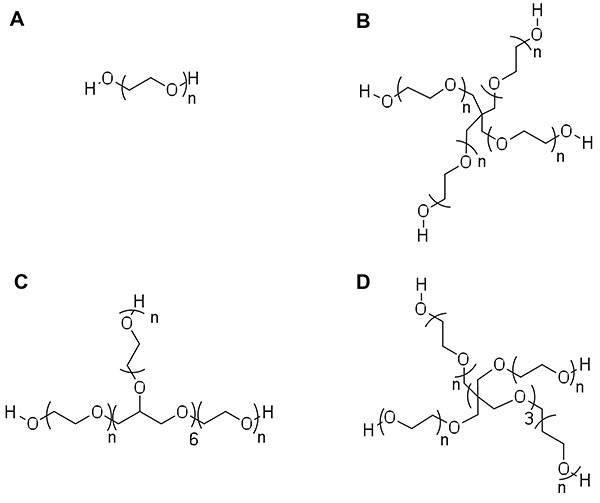 MSCs were unable to adhere to the unfunctionalized PEG hydrogels (Figure 6A), but upon inclusion of the cell adhesion peptide RGD they were able to adhere to and spread on the hydrogel surface (Figure 6B). 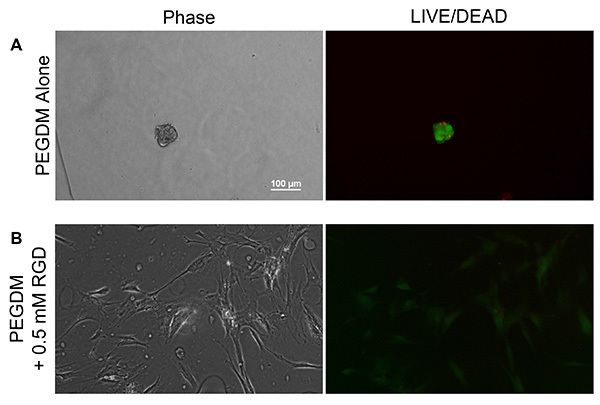 The LIVE/DEAD images presented do not represent the viability of the seeded MSC population, as MSCs are adhesion-dependent cells that detach from the gel surface upon death and will be removed during the media transfer process, resulting in artificial inflation of seeded cell viability. Rather, the fluorescent images are intended to demarcate between adherent cells and small variations in the hydrogel topology, which can be difficult under phase contrast alone. Interestingly, the nonspread cells seeded on the PEG-only gels stain positive for both calcein AM and ethidium homodimer, indicating that cells were dying at the time of imaging. One of the many advantages to PEG hydrogels is their highly tunable nature. Modifying the specific makeup of the PEG hydrogel affords researchers a high degree of control over properties such as modulus of elasticity. As illustrated in Figure 7, both PEG molecular weight (Figure 7A) and weight percentage (Figure 7B) are known to control hydrogel mesh size (ξ) and resultant hydrogel stiffness and release rate of encapsulated drugs. This was demonstrated by producing hydrogels with varying molecular weight PEGDM, and investigating the resultant hydrogel modulus and mesh size (Figure 8). All hydrogels were produced with 10 wt% linear PEGDM in PBS, with 0.05 wt% LAP as photoinitiator. 40 µl of hydrogel precursor solution was in 1 ml syringes with the tips cut off, and exposed to 365 nm UV light at 2 mW/cm2 for 10 min to form hydrogels, producing cylindrical geometries approximately 5 mm in diameter and 2 mm in height. Gels were allowed to swell in PBS for 2 days before mechanical testing. Hydrogel modulus was determined using a MTS QT/5 with a 5 N load cell while compressing between 5 and 10% of initial hydrogel height at a rate of 0.1 mm/sec. After mechanical testing was completed, mesh size was determined by measuring hydrogel mass pre-(Ms) and post- (MD) 24 hr of lyophilization via the Flory-Rehner equation as detailed in the discussion section, with calculations performed in MATLAB. As hypothesized, increasing the molecular weight of the PEG macromer caused an increase in hydrogel mesh size (Figure 8A) and a decrease in hydrogel stiffness (Figure 8B). Hydrogel mesh size and the resultant gel stiffness can also be controlled by altering weight percentage PEG. Hydrogels were produced with varying wt% of linear 10 kDa PEGDM, and hydrogel stiffness and mesh size were determined as previously described (Figure 9). As was illustrated in Figure 7B, increasing wt% PEG causes a significant decrease in mesh size (Figure 9A) and increase in hydrogel stiffness (Figure 9B). Hydrogels containing encapsulated bovine serum albumin (BSA) were formed using varying molecular weight PEG (2, 10, and 20 kDa). All hydrogels were produced with 10 wt% PEGDM in PBS containing 50 µg/ml BSA, as described for Figure 6. Gels were incubated in 1 ml PBS at 37 °C, and transferred to fresh PBS at each time point. Released BSA was quantified using the Bradford Assay from Thermo Scientific. Hydrogel mesh size was determined as described for Figure 8. As illustrated in Figure 7A, BSA release occurs more rapidly from hydrogels formed using higher molecular weight PEGDM, as a result of the larger mesh size within the hydrogel (Figure 10). Figure 4. Representative 1H-NMR of 2 kDa linear PEGDM functionalized using the microwave-assisted method. Percent functionalization can be calculated based on the observed: theoretical ratio of terminal methacrylate protons (a, b and c) to central PEG protons (d). Click here to view larger image. Figure 5. Representative MALDI-ToF of peptide GKRGDSG (A) before and (B) after functionalization using the microwave-assisted method. Note that the observed molecular weight peak after functionalization occurs at 744 g/mol, the expected weight of the methacrylamide functionalized peptide (676+68 g/mol) and not at the expected molecular weight of the un-functionalized peptide (676 g/mol). Click here to view larger image. Figure 6. Representative phase contrast (left) and LIVE/DEAD (green/red) fluorescent images (right) of MSCs cultured on A) PEG gels alone and B) PEG gels containing 0.5 mM methacrylamide functionalized GKRGDSG. MSCs are unable to adhere to and spread on the PEGDA gels alone, but upon incorporation of the cell adhesion peptide RGD, are able to adhere to and spread on the hydrogel surface. Click here to view larger image. Figure 7. A) PEG molecular weight and B) weight percentage PEG used to form hydrogel networks affects hydrogel mesh size (ξ) and resultant hydrogel stiffness and release rate of encapsulated drugs. A) Increasing PEG molecular weight (left to right) at constant weight percentage increases hydrogel mesh size, decreasing hydrogel stiffness and increasing the rate of drug release. B) Decreasing the weight percentage of PEG (left to right) used to form hydrogels increases hydrogel mesh size, similarly decreasing hydrogel stiffness and increasing the rate of drug release (not to scale). Click here to view larger image. Figure 8. A) Mesh size increases and B) hydrogel stiffness decreases with increasing molecular weight of the PEG macromer. n=10, error bars = SEM, *** p<0.001 by one-way ANOVA with Tukey's HSD post-hoc test. All statistical analyses were performed using Prism 5. Click here to view larger image. Figure 9. A) Mesh size decreases and B) hydrogel stiffness increases with increasing wt% PEG. n = 9-10, error bars = SEM, ** p<0.01, *** p<0.001 by one-way ANOVA with Tukey's HSD post-hoc test. Click here to view larger image. Figure 10. Release of encapsulated model drug bovine serum albumin (BSA) from hydrogels formed using 2 kDa, 10 kDa, 20 kDa molecular weight PEG. BSA release occurs more rapidly from hydrogels formed using higher molecular weight PEGDM, as a result of the larger mesh size within the hydrogel. n=6, error bars = SEM. The % BSA released is significantly different (p<0.0001) between all three groups at every time point except t=1 and 2.5 hr when the release from the 2 and 10 kDa gels are equivalent, by two-way repeat-measures ANOVA with Bonferroni post-hoc test. Click here to view larger image. The methods previously illustrated are invaluable for the synthesis of PEGDM and methacrylamide functionalization of peptides or other amine-containing compounds. These materials can then be used for regenerative medicine and drug delivery applications. Due to the hydrophilic nature of PEG, hydrogels formed from PEG macromers have a high water content similar to many tissues in the body2. This quality makes PEG very resistant to protein adsorption and therefore inert in the body3. However, the hygroscopic nature of PEG can prove troublesome during functionalization. If water is present in the PEG sample during the methacrylation procedure, the methacrylic anhydride will react preferentially with water to produce methacrylic acid, and poor functionalization of PEG will result. Therefore, one of the most important steps that can be taken to ensure successful methacrylation of the PEG or peptide is to maintain anhydrous reaction conditions. The recommended step of drying all glassware before use is intended to prevent water contamination. 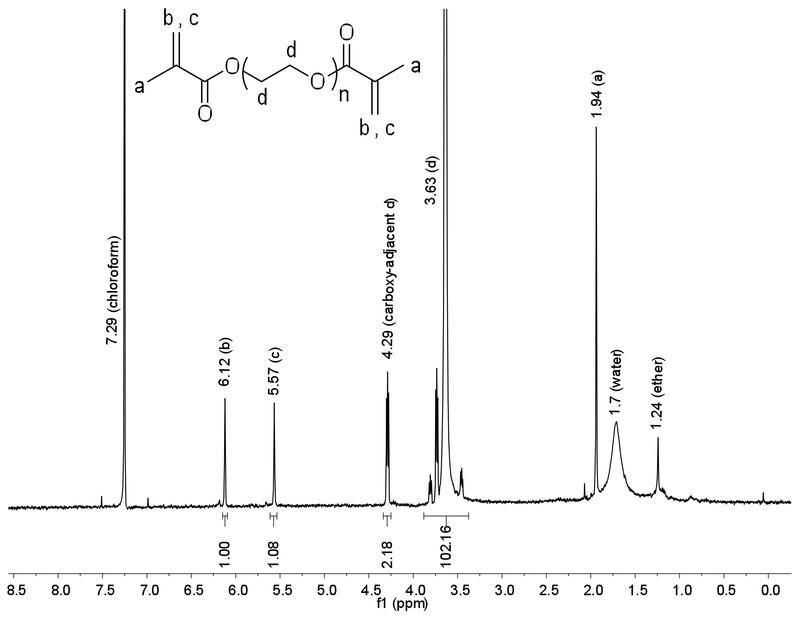 The presence of water in the sample can be seen in the NMR analysis, as a broad peak at 1.7 ppm (Figure 4). If poor methacrylation is observed even after drying all glassware, chemicals may be dried over sodium sulfate or other drying agents (molecular sieves etc.) prior to use. Distillation can also be used to remove water and purify methacrylic anhydride prior to use, and azeotropic distillation can be used to dry PEG23. In extreme cases, synthesis can be carried out in a glovebox to further ensure adequately anhydrous conditions. A second round of methacrylation, following the same procedure, can also be performed to increase functionalization. Because there is always a chance that additional rounds of functionalization will be required, care should be taken in step 1.7 and 1.9 to quickly collect PEGDM by vacuum filtration. Vacuum filtration for longer than is absolutely necessary increases exposure of PEG to air, increasing the opportunity for water adsorption. Even though the percent excess of methacrylic anhydride to hydroxyl functional groups remains unchanged, increasing the PEG functionalization (e.g. arm #) on the PEG precursor is generally associated with decreases in percent functionalization achieved (unpublished results, Benoit lab). To preemptively address this reduction in functionalization efficiency, or if particular difficulties are encountered achieving sufficiently high functionalization, the duration of the microwave reaction may be increased, provided that the microwave interval is maintained at 30 sec. While 10 molar excess is typically sufficient, the amount of methacrylic anhydride used in the reaction can also be increased to increase the percent functionalization achieved12. It is important that the additional precipitation step (1.9) be performed to achieve good NMR signals. While it is tempting to perform the second precipitation the same day as synthesis, drying the sample overnight before reprecipitating has been found to aid the removal of excess methacrylic anhydride and methacrylic acid. Sample preparation is also important for achieving clean NMR spectra, and therefore samples should be prepared using recommended conditions. Figure 4 demonstrates representative 1H-NMR results for correctly functionalized PEGDM. By analyzing the ratio of terminal methacrylate protons to central PEG protons, the PEGDM was determined to be adequately functionalized. MALDI sample preparation is similarly important for achieving a clear reading. MALDI is particularly sensitive to the presence of salts and high sample concentrations. If a clear MALDI reading (an intensity above 50 arbitrary units (a.u.) with a high signal:noise ratio) cannot be obtained, the sample solution should be diluted 1:100 in MALDI solvent before being combined with the matrix solution and reanalyzed. Figure 5 demonstrates representative MALDI-ToF results after correct peptide functionalization, cleavage, and sample preparation. Cleavage of a small sample of resin prior to functionalization (Figure 5A) shows correct synthesis of the peptide GKRGDSG, with correct methacrylamide functionalization of the peptide shown in Figure 5B. While functionalization of on-resin peptides is a relatively robust procedure, the cleavage conditions required for each sequence often requires tuning. For long sequences where many amino acids have protected side chains (>30 amino acids long, or >15 amino acids with protecting groups), duration of cleavage should be increased by one hour. However, if cleavage time is extended too much, peptide bond cleavage may result due to long-term acidic exposure. MALDI analysis can be very helpful in revealing any errors which occurred in peptide synthesis or cleavage. An observed decrease below expected molecular weights can indicate that amino acid(s) did not properly couple, or that peptide fractionation occurred (see Table 2 for sources of commonly observed changes in molecular weight). If the observed molecular weight is higher than expected by the weight of a protecting group used, it is likely that cleavage and deprotection was insufficient and the peptide should be recleaved for additional time. Table 2. Commonly observed changes in peptide molecular weight. Macromers produced using microwave-assisted methacrylation methods can be used in a number of regenerative medicine or drug delivery applications. The functionalized peptides and PEGDM synthesized here can also be incorporated into polymers using Nitroxide-Mediated Polymerization (NMP), Atom Transfer Radical Polymerization (ATRP) or Reversible Addition-Fragmentation Transfer (RAFT) methods24. Hydrogel networks can also be produced in the presence of cells, as previously demonstrated in the JoVE article by Khetan and Burdick22. This often requires the incorporation of cell adhesion peptides such as RGD or extracellular matrix molecules, as PEG alone does not provide cell-material interactions critical for survival and function of some cell types25. Peptides, for example, can be synthesized using traditional solid-phase peptide synthesis and functionalized as described here to allow for incorporation into hydrogel networks. As seen in Figure 6, inclusion of the methacrylamide-functionalized cell adhesion peptide GKRGDSG in hydrogels (0.5 mM) facilitates adhesion of human mesenchymal stem cells (MSCs) to PEG hydrogel surfaces, increasing the number of attached and spreading cells (Figure 6B), compared to PEG hydrogels without the cell adhesion peptide (Figure 6A). However, previous work has demonstrated that cell-material interactions are further enhanced by inclusion of 3,400 Da PEG spacers between adhesive peptides and hydrogel networks, to reduce peptide-integrin steric hindrance. Without inclusion of the spacer, cells may interact with PEG hydrogels via nonspecific proteins that adsorb to the peptide, rather than through integrin-mediated interactions with peptides26. To incorporate this PEG spacer and avoid nonspecific interactions, peptides can be conjugated to monofunctionalized PEG via N-hydroxysuccinimidyl-activated esters, as described by Hern and Hubbell26. Applications of hydrogel networks require tight control over material properties. A significant advantage to PEG hydrogels is a high degree of control over these properties. For example, the molecular weight, arm number, and the wt% of PEG used in the formation of hydrogel networks can be altered to fine-tune properties for specific applications. This allows tight control over hydrogel mesh size (ξ), which controls hydrogel swelling ratio (Q) and stiffness (modulus of elasticity, E). This is illustrated in Figure 7A and quantified in Figure 8, where increasing PEG macromer molecular weight results in an increase in hydrogel mesh size (Figure 8A) and a decrease in hydrogel stiffness (Figure 8B). Hydrogel properties can similarly be tuned by adjusting the amount of PEG used in the formation of hydrogels. Decreasing the weight percentage of PEG macromer results in an increase in hydrogel mesh size, which subsequently reduces hydrogel stiffness. Figure 7B illustrates and Figure 9 quantifies how the weight percentage of PEG used in hydrogel formation can be used to control mesh size (Figure 9A) and resultant hydrogel stiffness (Figure 9B). As substrate stiffness has been shown to affect cell behaviors such as stem cell differentiation29, the ability to tightly control stiffness is an important characteristic in hydrogel fabrication. 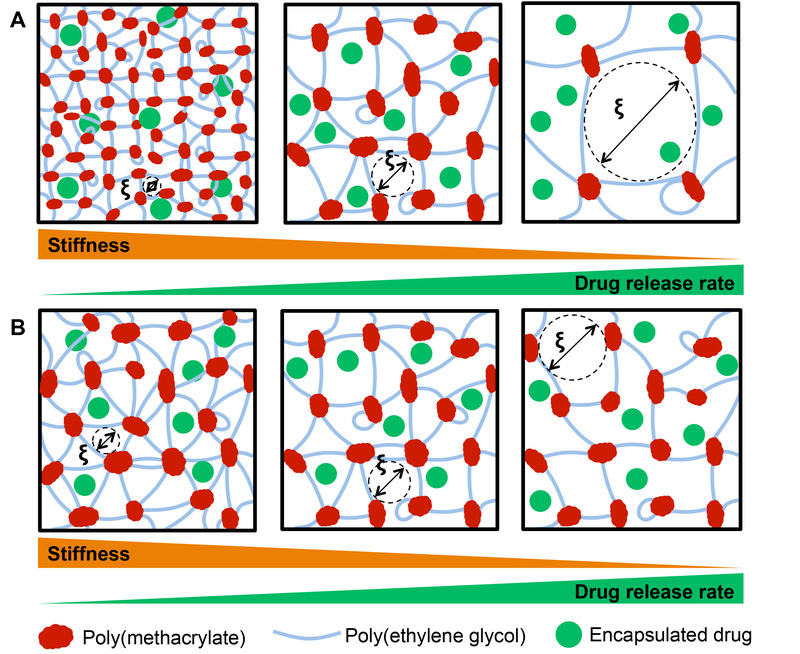 Hydrogels can also be used to control drug delivery. As illustrated in Figure 7A and demonstrated in Figure 10, increasing the molecular weight of PEG macromers increases mesh size of the hydrogel network, subsequently increasing the release of encapsulated model drug, bovine serum albumin (BSA). While hydrogel samples in this study were destroyed at t=195 hours to allow for measurement of hydrogel wet and dry masses for mesh size calculations, it is our experience that continued BSA release would occur had the samples been incubated for longer time periods. The incomplete release of BSA observed in Figure 10 is not unexpected, as other groups have also reported that BSA is resistant to diffusion within PEG hydrogel networks30. Incomplete release of encapsulated protein can occur due to hydrogen bonding between proteins and PEG macromers, or covalent binding between the methacrylate group on the PEG and primary amine groups on lysine residues in BSA31. Additionally, BSA is prone to aggregation and disulfide bond formation over time, which can increase its effective Stokes radius and hinder its release from hydrogels. As chain-growth hydrogels, such as these PEGDM hydrogels, are prone to network nonidealities and heterogeneous hydrogel mesh size (Figure 2A), it is also possible that a fraction of the encapsulated BSA is contained in regions of the hydrogel which have significantly smaller mesh size than the overall average within the gel, preventing its release. While incomplete, nonFickian release (data not shown) of encapsulated BSA was observed in this case, controlled Fickian release of numerous other model drugs, including insulin and ovalbumin, has been demonstrated using similar PEGDM hydrogels30. Additionally, Watkins and Anseth have used confocal laser scanning microscopy to demonstrate that release of fluorescent molecules from similar hydrogels is modeled acceptably with Fickian diffusion methods32. While the hydrogels formed in this study are nondegradable, network degradation is another parameter that can be incorporated into and tuned within these networks. Providing for controlled hydrogel degradation can result in alterations in cell behavior33, promotion of tissue growth or host tissue ingrowth, or elimination of the need for explantation34. Degradable PEG hydrogels are commonly synthesized by ring-opening hydrolytically degradable d,l-lactide, glycolide, or ε-caprolactone groups onto hydroxyl groups within PEG prior to methacrylation35. These three groups degrade by hydrolysis of ester functionalities, with the glycolide esters having the greatest susceptibility to degradation, followed by lactide, and caprolactone ester, due to their varying hydrophobicity. After incorporation of hydrolytically degradable groups, PEG can be further functionalized using the methacrylation procedure detailed in this article, enabling formation of hydrogel networks through subsequent radical-initiated chain polymerization36,37. 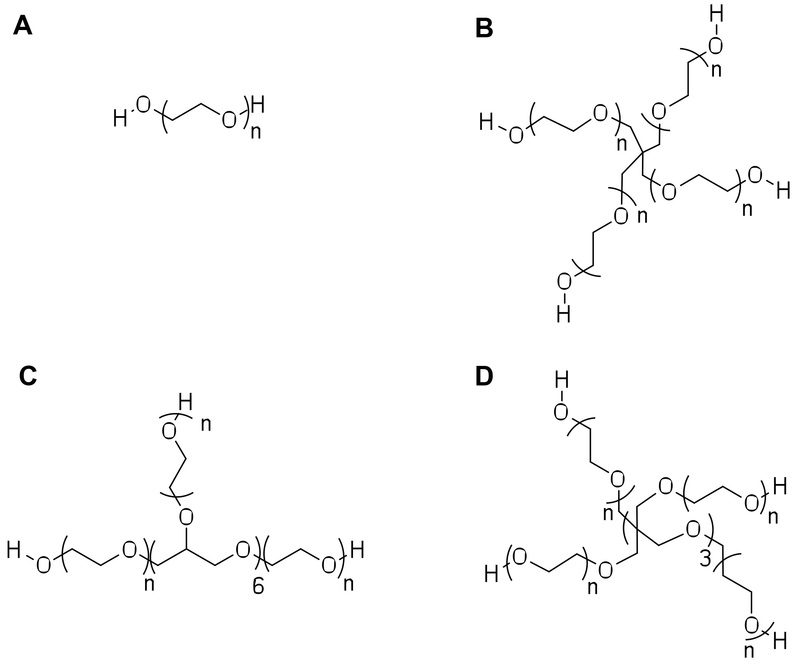 The rate of degradation of hydrogel networks can be controlled by varying the identity of the hydrolytically degradable group (glycolide, lactide, etc.) and by varying the number of degradable repeats incorporated in the structure35,38. 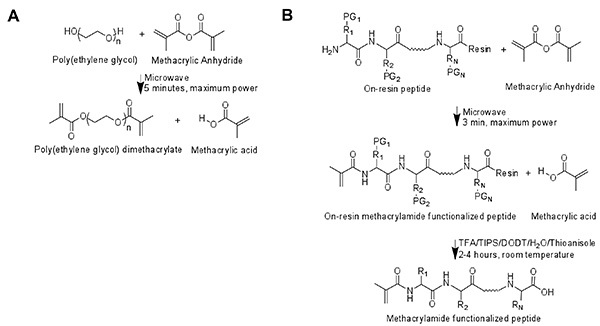 Theoretically, the methods demonstrated here could be used for acrylation of PEG and peptides by replacing the methacrylic anhydride with acrylic anhydride in steps 1.3 and 3.3, respectively. However, acrylic anhydride is more than 20 times the cost of methacrylic anhydride39,40, making microwave-assisted acrylation significantly less attractive than microwave-assisted methacrylation. We have demonstrated a simple, rapid method to functionalize PEG and peptides, how to evaluate the efficiency of this procedure, and given resources for using the synthesized materials to form hydrogel networks. These synthetic tools are highly versatile in their applications, and should prove a staple in any number of drug delivery and materials research laboratories. 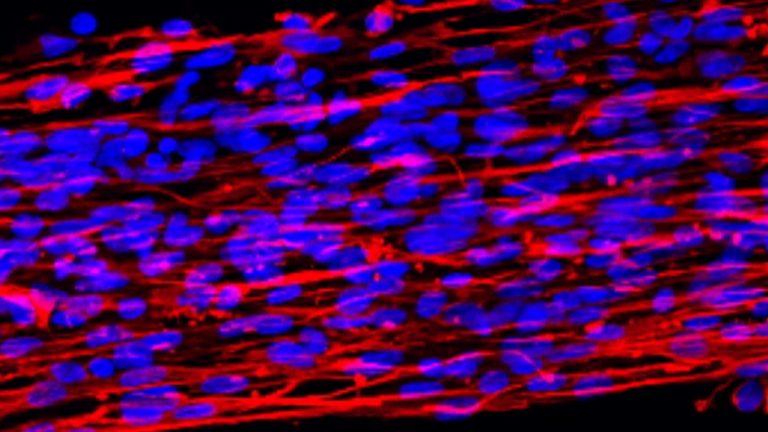 This work was funded in part by a Howard Hughes Med-into-Grad fellowship (AVH), by start-up funds provided to Dr. Danielle Benoit from the University of Rochester and the Orthopaedic Research and Education Foundation/Musculoskeletal Transplant Foundation (OREF/MTF). The authors would like to thank Dr. James L. McGrath for the use of his equipment. On-resin peptides Synthesized in-house On-resin peptides can also be purchased from Peptides International, GenScript, AAPPTec, etc. Lin, C. C., Anseth, K. S. PEG Hydrogels for the Controlled Release of Biomolecules in Regenerative Medicine. Pharm. Res. 26, 631-643 (2009). Ifkovits, J. L., Burdick, J. A. Review: Photopolymerizable and degradable biomaterials for tissue engineering applications. Tissue Eng. 13, 2369-2385 (2007). Peppas, N. A., Hilt, J. Z., Khademhosseini, A., Langer, R. Hydrogels in biology and medicine: From molecular principles to bionanotechnology. Adv. Mater. 18, 1345-1360 (2006). Lutolf, M. P., Hubbell, J. A. Synthetic biomaterials as instructive extracellular microenvironments for morphogenesis in tissue engineering. Nat. Biotechnol. 23, 47-55 (2005). Benoit, D. S., Durney, A. R., Anseth, K. S. The effect of heparin-functionalized PEG hydrogels on three-dimensional human mesenchymal stem cell osteogenic differentiation. Biomaterials. 28, 66-77 (2007). Benoit, D. S., Collins, S. D., Anseth, K. S. Multifunctional hydrogels that promote osteogenic human mesenchymal stem cell differentiation through stimulation and sequestering of bone morphogenic protein 2. Adv. Funct. Mater. 17, 2085-2093 (2007). Fairbanks, B. D., et al. A Versatile Synthetic Extracellular Matrix Mimic via Thiol-Norbornene Photopolymerization. Adv. Mater. 21, 5005 (2009). Moon, J. J., Hahn, M. S., Kim, I., Nsiah, B. A., West, J. L. Micropatterning of Poly(Ethylene Glycol) Diacrylate Hydrogels with Biomolecules to Regulate and Guide Endothelial Morphogenesis. Tissue Eng. A. 15, 579-585 (2009). Burdick, J. A., Anseth, K. S. Photoencapsulation of osteoblasts in injectable RGD-modified PEG hydrogels for bone tissue engineering. Biomaterials. 23, 4315-4323 (2002). Yanez-Soto, B., Liliensiek, S. J., Murphy, C. J., Nealey, P. F. Biochemically and topographically engineered poly(ethylene glycol) diacrylate hydrogels with biomimetic characteristics as substrates for human corneal epithelial cells. J. Biomed. Mater. Res. A. 101A, 1184-1194 (2013). 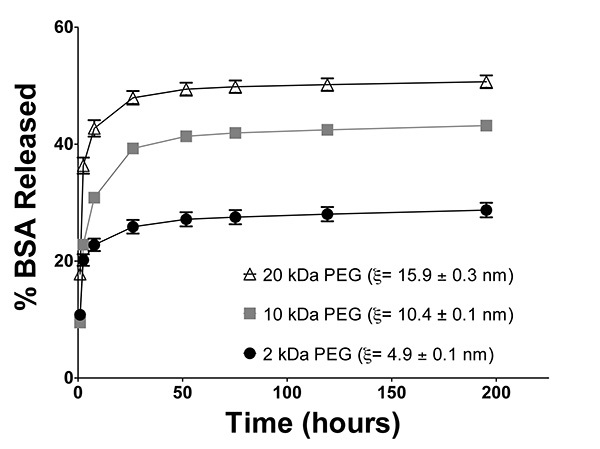 Benoit, D. S. W., Anseth, K. S. Heparin functionalized PEG gels that modulate protein adsorption for hMSC adhesion and differentiation. Acta Biomater. 1, 461-470 (2005). Lin-Gibson, S., et al. Synthesis and characterization of PEG dimethacrylates and their hydrogels. Biomacromolecules. 5, 1280-1287 (2004). Anseth, K. S., Wang, C. M., Bowman, C. N. Reaction Behavior and Kinetic Constants for Photopolymerizations of Multi(Meth)Acrylate Monomers. Polymer. 35, (94), 3243-3250 (1994). Bencherif, S. A., et al. End-group effects on the properties of PEG-co-PGA hydrogels. Acta Biomater. 5, 1872-1883 (1016). Rydholm, A. E., Bowman, C. N., Anseth, K. S. Degradable thiol-acrylate photopolymers: polymerization and degradation behavior of an in situ forming biomaterial. Biomaterials. 26, 4495-4506 (2005). Zustiak, S. P., Leach, J. B. Hydrolytically Degradable Poly(Ethylene Glycol) Hydrogel Scaffolds with Tunable Degradation and Mechanical Properties. Biomacromolecules. 11, 1348-1357 (2010). Malkoch, M., et al. Synthesis of well-defined hydrogel networks using Click chemistry. Chem. Commun. 2774-2776 (2006). Hoffman, M. D., Benoit, D. S. Emerging Ideas: Engineering the Periosteum: Revitalizing Allografts by Mimicking Autograft. (2012). Hoffman, M. D., Xie, C., Zhang, X., Benoit, D. S. The effect of mesenchymal stem cells delivered via hydrogel-based tissue engineered periosteum on bone allograft healing. Biomaterials. (2013). Hubbell, J. A., Lutolf, M. P., Raeber, G. P., Zisch, A. H., Tirelli, N. Cell-responsive synthetic hydrogels. Adv. Mater. 15, 888-892 (2003). Lidstrom, P., Tierney, J., Wathey, B., Westman, J. Microwave assisted organic synthesis - a review. Tetrahedron. 57, 9225-9283 (2001). Khetan, S., Burdick, J. Cellular encapsulation in 3D hydrogels for tissue engineering. J. Vis. Exp. (32), e1590 (2009). Antonios, M., Kurtis, K., Lucas, K. Drying poly(ethylene glycol). Nat. Protoc. Exchange. (2012). Nicolas, J., Mantovani, G., Haddleton, D. M. Living radical polymerization as a tool for the synthesis of polymer-protein/peptide bioconjugates. Macromol. Rapid Comm. 28, 1083-1111 (2007). Nuttelman, C. R., Benoit, D. S. W., Tripodi, M. C., Anseth, K. S. The effect of ethylene glycol methacrylate phosphate in PEG hydrogels on mineralization and viability of encapsulated hMSCs. Biomaterials. 27, 1377-1386 (2006). Hern, D. L., Hubbell, J. A. Incorporation of adhesion peptides into nonadhesive hydrogels useful for tissue resurfacing. J. Biomed. Mater. Res. 39, 266-276 (1998). Andreopoulos, F. M., Beckman, E. J., Russell, A. J. Light-induced tailoring of PEG-hydrogel properties. Biomaterials. 19, 1343-1352 (1998). Merrill, E. W., Dennison, K. A., Sung, C. Partitioning and Diffusion of Solutes in Hydrogels of Poly(Ethylene Oxide). Biomaterials. 14, 1117-1126 (1993). Weber, L. M., Lopez, C. G., Anseth, K. S. Effects of PEG hydrogel crosslinking density on protein diffusion and encapsulated islet survival and function. J. Biomed. Mater. Res. A. 90A, 720-729 (2009). Mellott, M. B., Searcy, K., Pishko, M. V. Release of protein from highly cross-linked hydrogels of poly(ethylene glycol) diacrylate fabricated by UV polymerization. Biomaterials. 22, 929-941 (2001). Watkins, A. W., Anseth, K. S. Investigation of molecular transport and distributions in poly(ethylene glycol) hydrogels with confocal laser scanning microscopy. Macromolecules. 38, 1326-1334 (2005). Anseth, K. S., Benoit, D. S. W., Durney, A. R. Manipulations in hydrogel degradation behavior enhance osteoblast function and mineralized tissue formation. Tissue Eng. 12, 1663-1673 (2006). Hillwest, J. L., et al. Prevention of Postoperative Adhesions in the Rat by in-Situ Photopolymerization of Bioresorbable Hydrogel Barriers. Obstet. Gynecol. 83, 59-64 (1994). Sawhney, A. S., Pathak, C. P., Hubbell, J. A. Bioerodible Hydrogels Based on Photopolymerized Poly(Ethylene Glycol)-Co-Poly(Alpha-Hydroxy Acid) Diacrylate Macromers. Macromolecules. 26, 581-587 (1993). Skaalure, S. C., Milligan, I. L., Bryant, S. J. Age impacts extracellular matrix metabolism in chondrocytes encapsulated in degradable hydrogels. Biomed. Mater. 7, 024111-0210 (2012). Hoffman, M. D., Benoit, D. S. Agonism of Wnt-beta-catenin signalling promotes mesenchymal stem cell (MSC) expansion. J. Tissue. Eng. Regen. Med. (2013). Sawhney, A. S., Pathak, C. P., Vanrensburg, J. J., Dunn, R. C., Hubbell, J. A. Optimization of Photopolymerized Bioerodible Hydrogel Properties for Adhesion Prevention. J. Biomed. Mater. Res. 28, 831-838 (1994). Methacrylic Anhydride [Internet]. Available from: https://us.vwr.com/store/catalog/product.jsp?catalog_number=AAAL14357-18 (2013). Acrylic Anhydride [Internet]. Available from: http://www.polysciences.com/Catalog/Department/Product/98/productid--40/ (2013).